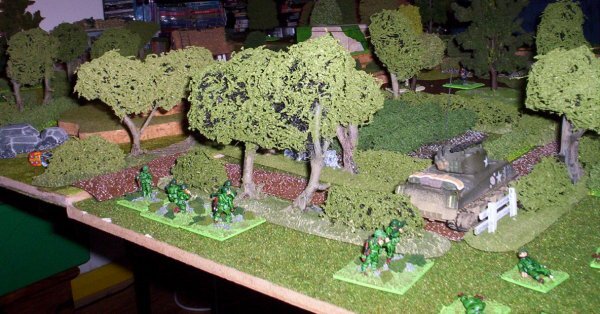 At Historicon in 1995 a friend challenged me to design a historical miniatures wargame that lacked two features present in most rulesets: rulers and fixed game turns. The result is Crossfire - a fast-paced simulation of shifting tactical initiative, where the action unfolds like a film highlighting the critical events of a battle. Crossfire offers the player dozens of critical decisions to make every game, and each one may decide the battle. Crossfire focuses on company-level, infantry operations by stressing three interrelated features: movement, firepower, and terrain. It assumes the tabletop action is occurring well within the effective ranges of WWII small arms. 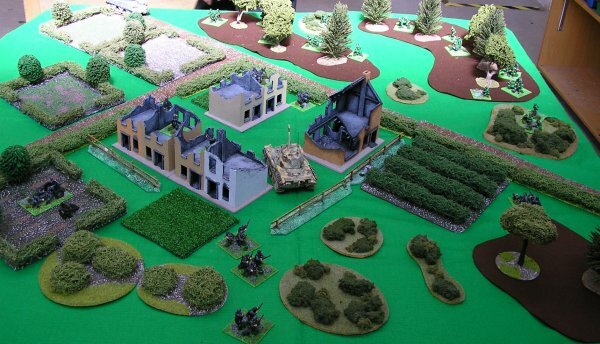 By stressing these fundamentals, player commanders in Crossfire are encouraged to use covered terrain routes for troop movements, and establish fire bases that both support their own movements and interdict those of the enemy. Variable troop quality and national command & control differences modify these fundamentals. 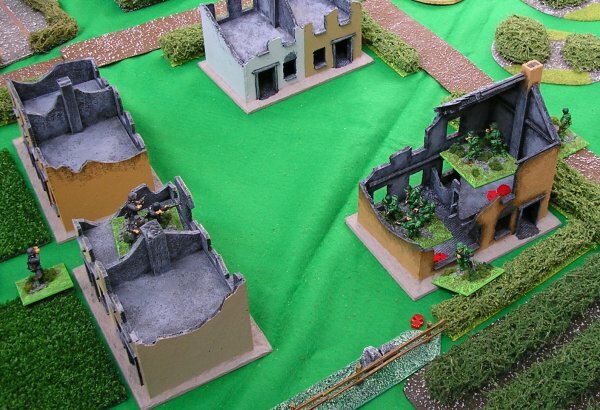 These conflicting tactical concerns will challenge the best gamers in our hobby. 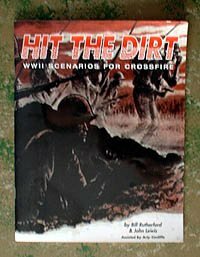 And because these concerns were paramount in the minds of real commanders, I believe Crossfire also succeeds as a simulation, in spite of its abstractions. We have included a Scenario Generation system which enables gamers to simulate typical combat problems with an infinite number of outcomes; tournaments may be played with this method. 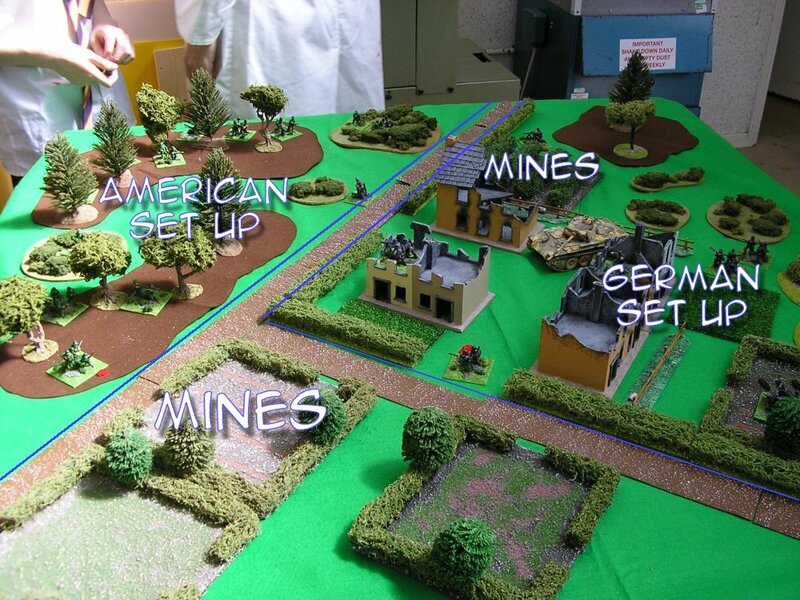 One specific scenario has been added showing how to design games based on historical actions. We will be releasing a book of such scenarios in the future. 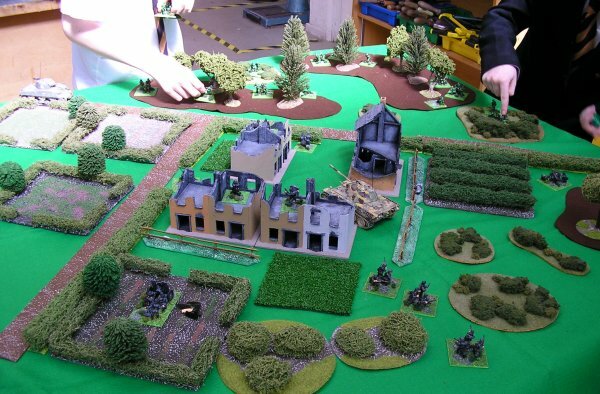 The average Crossfire game can be played quickly with about 40, 15mm or 20mm figures on a side and perhaps a vehicle or two, and the game works equally well at any figure scale. Rebasing is not required. I tried to "push the envelope" with this design, and extend the possibilities of traditional miniatures games. 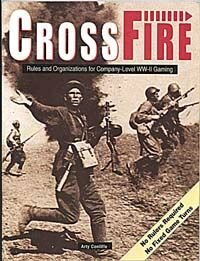 I first noticed Crossfire from a battle report in Wargames Illustrated a few years ago. The description of the game and the rules that were used to play it was intriguing; so intriguing that I went out the next day and bought the rules. As promised, they lived up to my expectations and several years of happy gaming lay ahead for me. I wasn’t a WWII gamer at the time. I didn’t have any WWII figures and hadn’t had since my 1:32 scale Airfix figures that I bought around 1970 which were long gone. 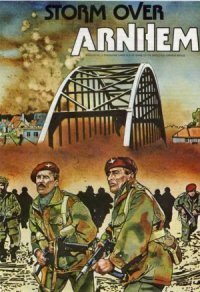 An extensive collection of Commando and War Picture Library comics had also disappeared. Somewhere my interest in WWII had left me. 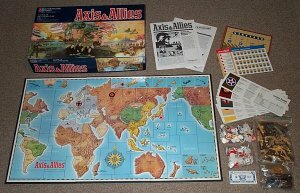 ​I had three WWII games in my collection, Axis and Allies, Storm Over Arnhem and Up Front! Each of these offers a different gaming experience in the same general setting; none of them rely on detailed knowledge of the period or the hardware. Up Front! 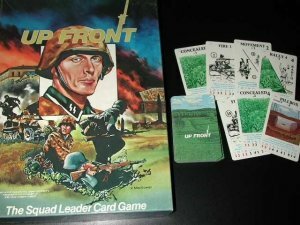 Is the most significant of these, a revolutionary board game about small unit tactics in WWII that uses cards. There are no distances and range is expressed only in terms of semi-abstract bands. The game puts you in the position of a squad commander and gives you a realistic objective to accomplish. You use your hand of cards, tailored to reflect your national characteristics, to move, shoot and position your forces relative to your opponent. The choices the game presents you with are very like the choices that a real squad commander is faced with. You try your best, sometimes trusting to luck if necessary in an uncertain setting, never sure if your opponent has got you in his sights and is just waiting for you to break cover. Tactics that work in real life work in the game. Things that would bring your career to an abrupt halt do so in the game. With Crossfire I found that Up Front! Had essentially been transferred to the tabletop. The basic idea in Crossfire is that you can continue doing what you want to do until it doesn’t work. This means that when you have the initiative you may move, shoot and close assault with your troops until you either lose the initiative by failing to carry out an action successfully or have the initiative taken from you by the enemy’s reaction to one of your actions. There is no measuring, figures move from terrain feature to terrain feature. Each of these hops can be countered by enemy reactive fire if he can see you. If his fire has no effect, or he doesn’t shoot at all, you continue moving and only stop when you get where you wanted to go. There are no ranges. The table represents an area that is small enough to be within range of the weapons of the period. If you can be seen, you can be shot. Shooting is carried out a squad at a time. Each squad rolls a number of D6 dependant on its type, a rifle squad rolls three, and any 5 or 6 is a hit. One hit will pin the target, two hits will suppress it and three hits will kill it. A suppressed squad that is suppressed again is killed. If the target is in cover you roll one less dice. Simple. Using an officer to set up a crossfire and direct more firepower at a target greatly increases your chance of success, hence the name of the rules. If you shoot at something and don’t get a result you will give the initiative to your opponent. If you are moving and take reactive fire that suppresses or kills a squad your opponent has taken the initiative from you. In both cases your turn ends. The key is deciding what order to do things in, prioritise and win. The emphasis is on making the correct choices and the game rewards those who retain a clear idea of their aims and objectives. 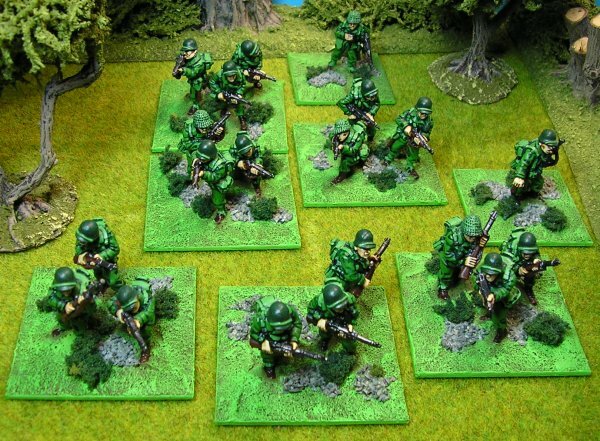 You need to employ basic infantry tactics to be successful, movement without covering fire and failing to have an all round defence will see you losing the game very quickly. 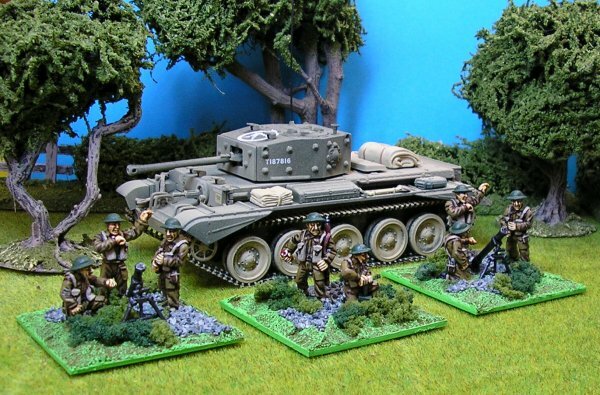 At almost the same time as I went out and bought my set of Crossfire rules Harlequin (later Black Tree Design) released a set of 28mm WWII figures. Not just any figures either, really nice figures. I bought a set of Germans and Americans immediately (There were no British and I’ve never been interested in the Russians). Strangely enough this mirrored my first purchase of WWII figures from Airfix thirty years before. 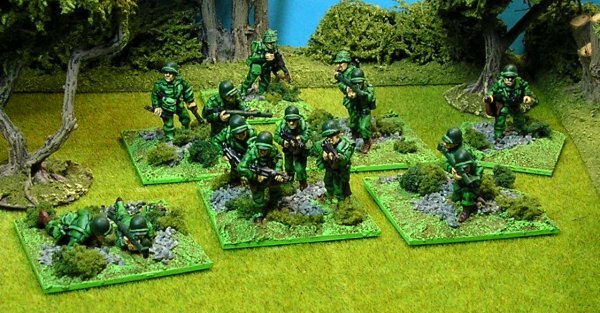 The basic ‘army’ in Crossfire is a Company made up of three Platoons. Each Platoon is split into three Squads. 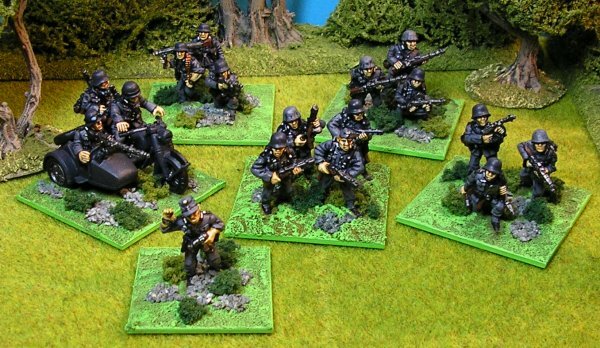 Officers, Platoon Commanders and Company Commanders, are added along with Company assets such as machine guns and mortars and in a very short time you have a viable force for the tabletop. The smallest independent unit is the Squad. This is a single base of figures representing about ten men. I chose to have three figures to each Infantry Squad base and picked a 50mm square as my base size. I wanted to go for 60mm square as with my other element based games but this looked too big. Officers were based on 40mm squares; a single figure for a Platoon Commander and a pair of figures for a Company Commander. This larger size helps differentiate them from game markers. 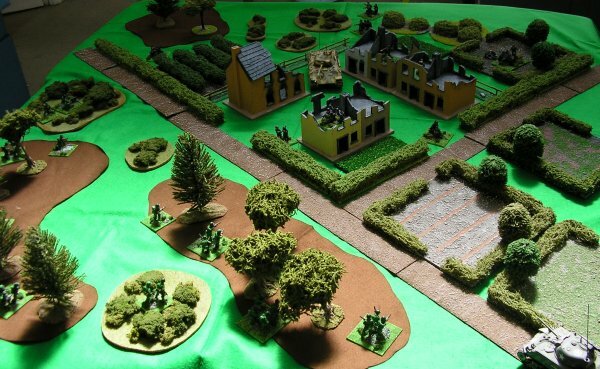 Markers for the game were put on smaller bases 30mm squares or 25mm circles. 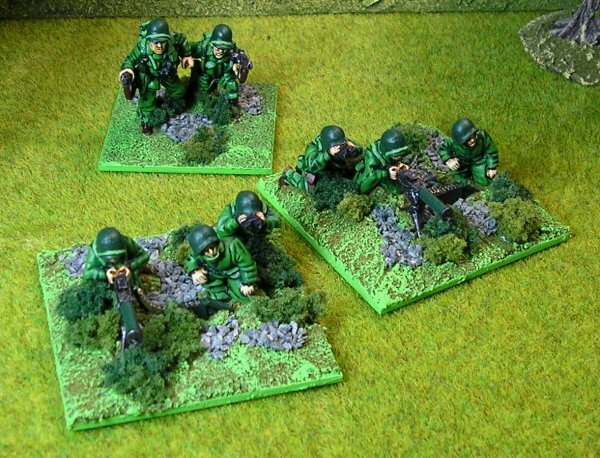 Machine guns count as Squads so they are on a 50mm square base. 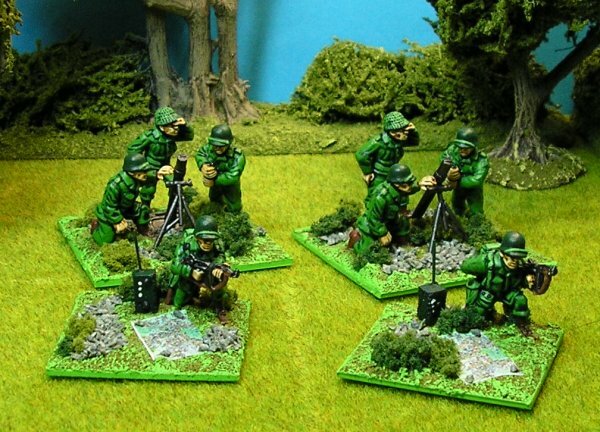 Mortars rarely appear on the tabletop and are represented by their Forward Observer who is on a 40mm base. I like mortars so I painted them up and put them on 50mm squares. Three Platoons, each of three bases of three figures and a single figure PC. Company Commander (two figures), and attached machine gun (three figures and the gun). Forward Observer (one figure) and optional mortar (three figures and mortar). There are variations on this depending on nationality and type of troops etc. but the above is a typical starting force. If you go on and amass three Companies you will have a Battalion which will allow the use of more and bigger support material. 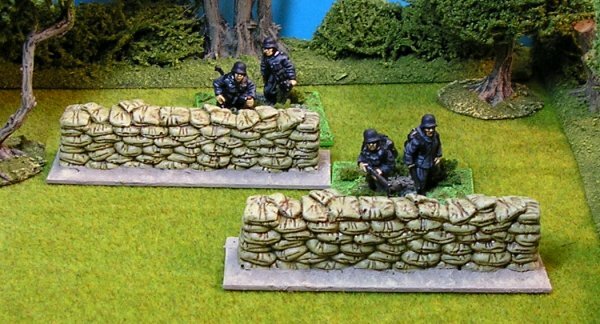 You will need a big table though; in 28mm a Company can operate on a four foot frontage but is more comfortable with six foot. A Battalion would be cramped on a twelve foot table. There are other things you will need before you start playing. You will need lots and lots of terrain features. Open ground is killing ground. 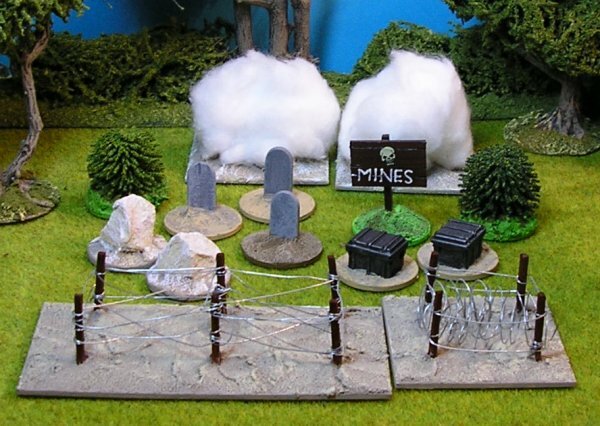 The barbed wire and smoke are on multiple Infantry bases as per the rules. The minefield sign affects a single terrain feature or the gap between two so no template is needed. I use the grave stones as ‘pinned’ and ‘suppressed’ markers, these are in addition to the casualty figures that are used as well. One marker is ‘pinned’, two is ‘suppressed’. I use the little bushes as ‘prone’ markers because ‘prone’ indicates that a Squad has found cover in the open. An actual prone figure is too similar to a casualty marker for me. The ammo boxes are a bit sci-fi but will do for me, they represent ‘no fire’ meaning a squad can no longer shoot for a while. I used to use the little rocks (sort of representing a blockage) but these are now objective markers and hidden squad markers. Most of these markers can be left out on the table without upsetting the ‘look’ and are therefore easy for everybody to grab as needed. 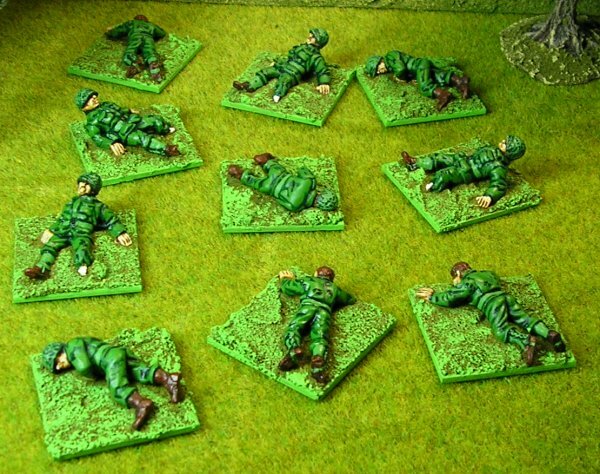 I found that getting hold of sandbags for 28mm figures was almost an impossibility. These days it is much easier to find them. I settled on using some mealie bags from Hovels which I think work okay. I play Crossfire because of the type of game it gives. It emphasises people over hardware and its WWII setting is really only incidental. 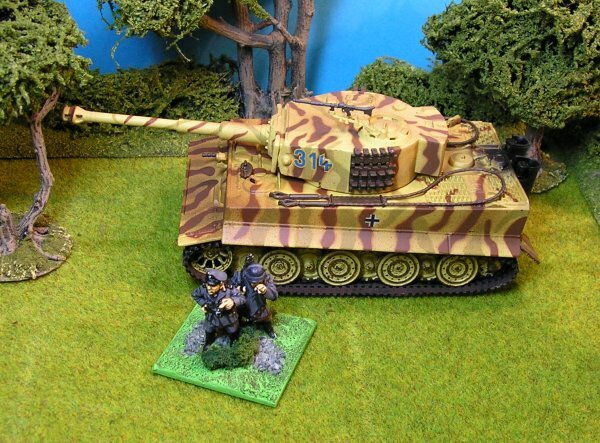 I am not interested in cammo patterns of the SS, nor do I care if the Tiger tank was god of the battlefield. I am happy with a level of abstractness that separates my games from the reality they are representing. I am recreating the games of my childhood for me to enjoy. Crossfire’s ‘anywhen’ feel helps me do this. Consequently, my painting schemes reflect the ‘alternative’ WWII that I was brought up with. My Germans are grey. 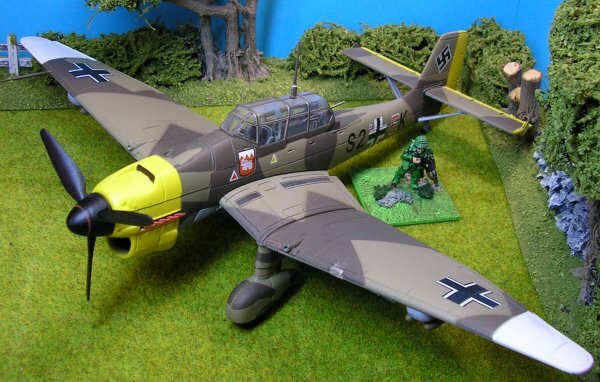 Not ‘fieldgrau’ but Airfix grey, I would have liked them to have all been armed with schmeisers too but alas…. My Americans are green, regardless of which articles of their varied uniform they are actually wearing, and my Tommies are in khaki. 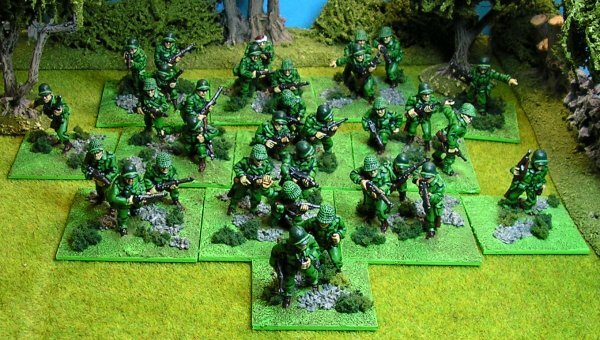 Having both American and British Infantry is a redundancy so my British are Commandoes, all wearing ‘caps comforter’ as they did for Airfix and through countless daring raids in the war comics. It’s deliberately not meant to look realistic. This will bother some people I know but these are my figures for my enjoyment and you can take them or leave them as you please. It really isn’t necessary to write me ranting e-mails about it (you know who you are you sad bastards). I like things to be clear on the tabletop so I have adopted some other idiosyncrasies with my basing. Engineers are differentiated in the rules by their abilities; they can remove wire etc. I have based my engineers in twos instead of threes so they can be differentiated during play quickly. 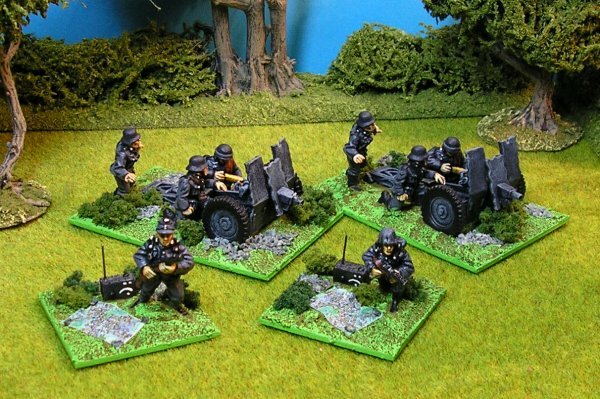 They are all armed with anti tank weapons or similar and are the only troops with anti tank capabilities in my games. The rules allow you to pay extra points and designate Infantry stands as having bazookas or whatever. This involves pointless record keeping so in my games you pay your points and a Squad of ‘engineers’ with bazookas are added to your force. 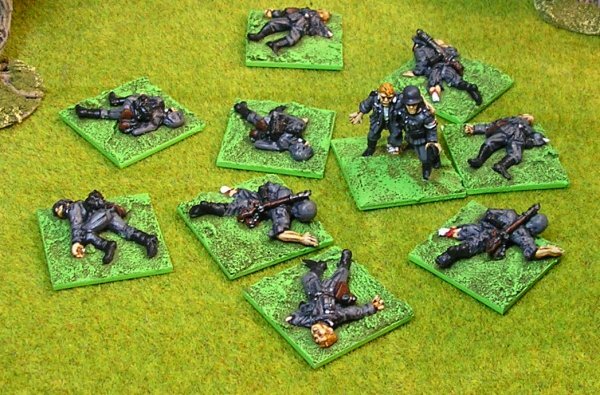 With the exception of the ‘engineers’ the number of figures on a base relates to the number of shooting dice they throw. Infantry throw three and have three figures to a base. Machine guns throw four and have four figures on the base (three crew and the gun). 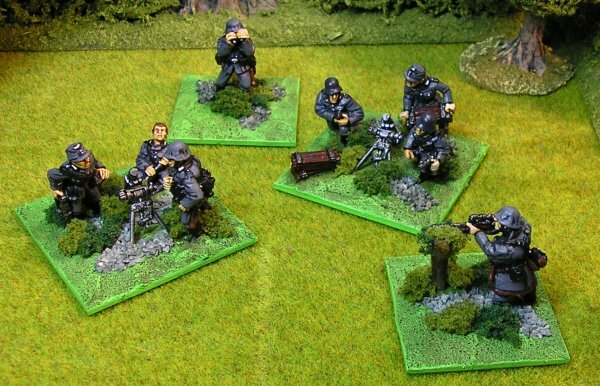 There are also sub-machine gun Squads which throw four dice at close range so I base them in fours also. Vehicles are not common on a Crossfire table and since I am a bit rubbish at painting them I opted for die cast instead. The limited range of options is off set by the fact that they are usable straight from the box. I settled on 1:50 for my scale as it looks ok to me. Most of my vehicles are from Corgi which come fully painted and weathered. I have a few from other manufacturers which are not as good but perfectly adequate for my needs. I have changed two rules in Crossfire, both regarding armoured vehicles. Firstly I allow tanks etc. to have unlimited actions the same as Infantry. This doesn’t unbalance the game and keeps to the feel of Crossfire far better than the existing ‘one action’ rule. If you don’t believe me, try it. Secondly I don’t allow armoured vehicles to initiate close combat. I discovered the Panzer grenadier super halftrack gambit one day which allowed me to destroy my opponent’s entire American force in a single move with only one halftrack. If you want to know how it works, load a half track with your best platoon and PC, add in a CC and engage your opponent’s infantry, preferably coming in from the flank. He shouldn’t even get to roll a dice as you will out-factor him by too much. This is gamesmanship and has no place on my table. 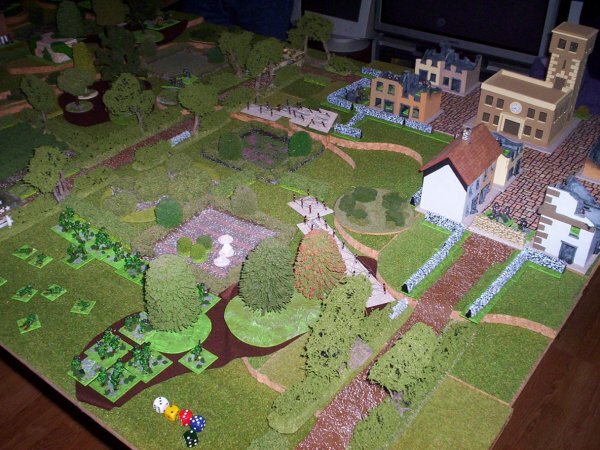 This was the first actual wargame that we've had at the school club I run. Until now we've been painting up figures for a game of Star Mogul but I thought it would be nice to introduce some of the students to a real wargame so they could see if they really did like the idea. I chose Crossfire because it doesn't require you to know the rules in order to play, all the players have to do is decide what they want to do and then we see if they succeed. I designed a simple, low trooop density scenario which still used several different troop types to keep things interesting. We played with 28mm figures on a roughly 4ft x 4ft board so that battle was joined immediately and nobody had to wait around. 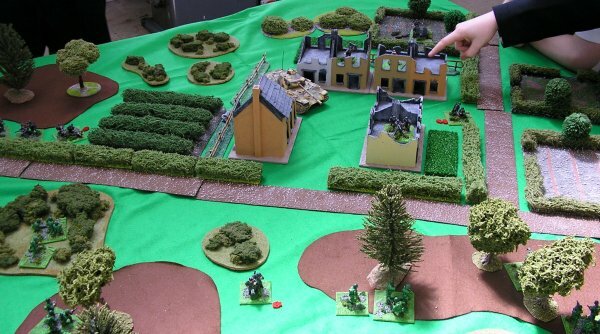 The German player is defending a small farm by a road junction in order to delay the Allied advance and allow the rest of the German forces in the area to regroup. The American player is controlling a Company strength reconnaissance force tasked with clearing the German position. The German player set up first, not hidden because it was our first game. He was allowed to put his troops anywhere within the 'V' formed by the two roads. The two minefields were hidden and could be placed anywhere on his side of the long road. He put one in the vineyard and one in the field next to the junction. The Americans started with the initiative and set up in the woods on the other side of the long road. The Americans opened their offensive by sending their Sherman up to the junction and then down the turn-off in order to engage the German Engineers. It managed to suppress the Engineer squad but was instantly killed by the Panzer when it unnecessarily tried to change position for a better shot. Having seized the initiative the Germans proceeded to spray the Americans in the woods with machine gun fire from the buildings. This caused several suppressions and the loss of both bazooka-armed Engineer squads. The removal of the Americans' anti-tank capability encouraged the Germans to try an advance of their own. 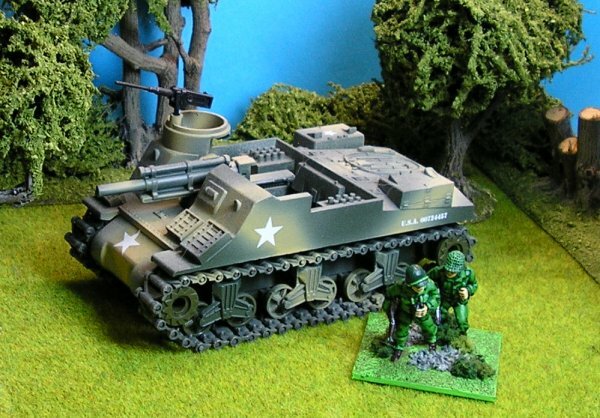 The Panzer moved forward and started shelling the woods whilst the Infantry Platoon tried to advance on the Germans' right flank and attack the US machine gun.The 75mm Infantry gun started dropping rounds on the already reeling Americans as well. Things were looking bleak for the Americans and cries of 'We've lost, what's the point of going on?' were heard. Cooler heads prevailed though and heavy mortar fire was called down on the buildings which killed the troublesome German machine gun and allowed the Americans to surge forward across the road, out of sight of both the 75mm spotter and the German tank. Although some well-placed smoke stopped the Americans taking fire from the German Infantry, the German Engineers managed to halt them long enough for the second machine gun to replace the first in the building. Its fire, along with the Engineers', started to cause more casualties amongst the American troops who did their best to shelter behind the covering hedge. Gleeful German chuckles could be heard as more and more Americans were removed from play. Undaunted, the Americans switched their focus and sent the SMG squad and some Infantry to try and get around the buildings. Unfortunately they chose to cross the vineyard and the mines pinned the Infantry squad. The Engineer PC and the SMG squad carried on though and, horror of horrors, contacted the German tank from the rear. A quick round of close combat finished with the Germans losing their armour. On their left flank, the American machine gun was starting to win the firefight with the German Infantry who were mostly pinned or suppressed. Only the single Squad of German Engineers was left to stop the surprising American breakthrough. True to form they killed the SMG squad and suppressed the Infantry who had (finally) caught up to support them. Once again it looked like the Americans had stalled. The American FOO had other ideas and repositioned himself so that he could call in some fire on to the German Engineer squad. The rounds whistled in and destroyed the Engineers with the first salvo. Rallying to their Officer, the Americans stormed forward to destroy the 75mm gun in hand-to-hand combat and win the game. A couple of weeks on and we tried the same scenario again but with the players changing sides. 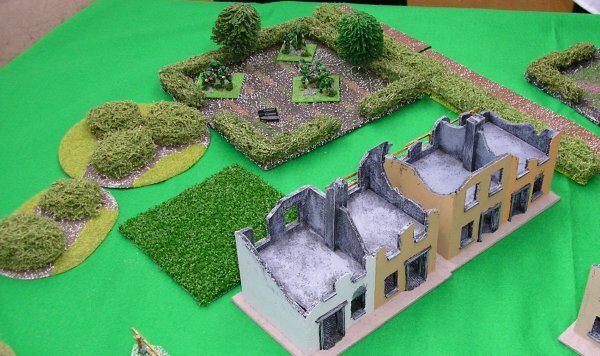 As an opener the Americans mortared the building by the road junction and suppressed the HMG and Company Commander that were using it for shelter. They then sent a platoon storming across the road hoping to take the building with a quick assault. The attacking platoon came under heavy fire from the Germans though and suffered a squad and CC suppressed and another squad pinned. 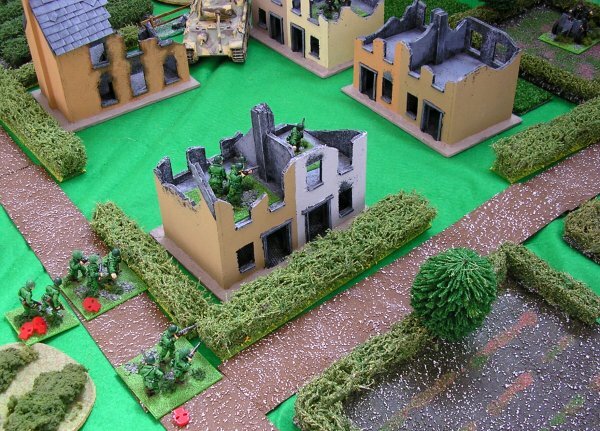 The Germans failed to rally the suppressed building occupants however and, in a brave move, the unpinned US squad and their PC successfully assaulted the building. Unfortunately, once there was no chance of hitting friendly units, the German tank quickly cleared the building of its inhabitants. Once it had achieved this it moved on to hunt other enemy units safe in the knowledge that the Sherman had already been destroyed in an unsupported attack on the 75mm gun. American Engineers stormed the large building by the vinyard now that the Panzer wasn't covering it. The reaction fire from the last defending German squad suppressed a squad but the Germans weren't able to capitalise on this. An american bazooka round suppressed the German squad who were finished off with the bayonet. The troublesome FOO for the German gun was swept away next and then the gun itself followed. The Engineers finally headed back to the road junction and assaulted the Panzer from the rear. The tank stood no chance and was destroyed easily. While the assaults had been happening an American platoon and the HMG had been trading shots with a small German force in some woods. Once the American Engineers moved in to join this fight the Germans conceded the encounter and withdrew giving the Americans a second victory in the series. This game was very different from the first. For a start it only took 40 minutes including setting up whereas the first game took over two hours. It seemed everyone had a grasp of the rules and individual initiatives were longer with many more 'moves' being strung together as actions were prioritised. There were still cries of despair from the Americans after some initial losses though, these were proved groundless of course and soon changed to cries of 'kill' and 'destroy' once the attack gained momentum. The loss of both unsupported tanks still seemed to surprise everyone even though we'd discussed this between games. Dean and Max, both 12, put up a good German defence and made some very good choices even though they eventually lost. Max declared that Crossfire wasn't as easy as Warhammer but he's only young so there's hope for him yet. 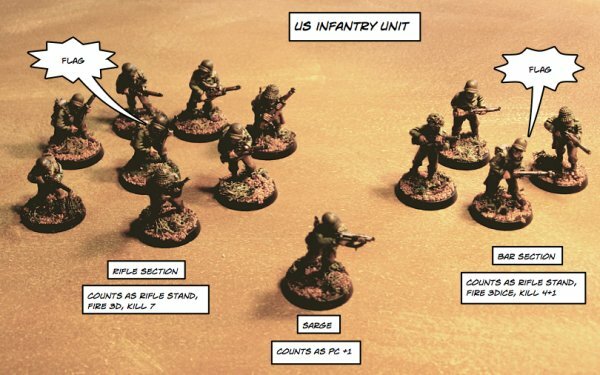 Consider a Crossfire base as a loose bunch of models, from now on they are "the base". Choose one of them, it is "the flag". The flag is the one that must clearly express its facing for moving and firing. All the other models must be within one CD of it (pick a CD, and put the hole over the flag's head. Every other model of the base must fit under the CD. 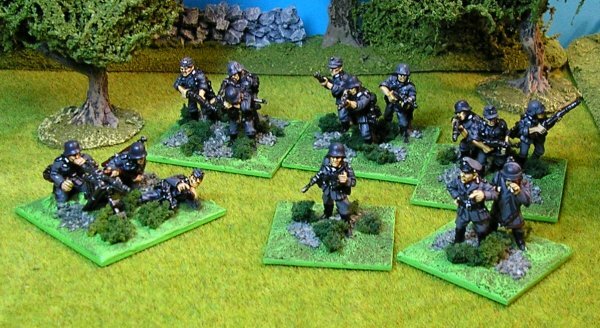 A typical base is a fire team: the Sergeant is the flag and five riflemen are the models of the base. Now play Crossfire as normal (better the 1:1 variant), considering the flag as the centre of the base for spotting purposes. When a base receives a pin, place it near the flag. All the base is pinned as per Crossfire. When the base receives a suppress, place the marker near the flag and remove one model from the base. This simulates the weakening effect of intense firefight. A larger base will last longer. When the base is killed, either by direct kill or by double suppression, remove from the base a number of models equal to the actual number of models present in the firing base. The remaining not-removed models (if any) are pinned. A fresh base will erase a weakened one. Tanks, mortars, HMGs count as 5 models when determining number of opponents killed. ISW (BAR, Bren, etc) count as 1 model more then those present in the base (a 4 men strong BAR section counts as 5 models for the killing). As you may imagine, this improves the effects of suppression, as it leaves the base weakened even if rallied. On the other hand the kill may prove to be less lethal when inflicted by a weakened base. The points value of the units present in the OOB must take into account the fact that larger bases are remarkably more powerful than small ones. --Command section (count as PC+1/+2); 5 models; does not fire. Fire Team; 7 men; 3 Dice. .30 cal section; 3 men; 4 Dice (until one model is left counts as 5 men for the killing). 81mm mortar; 3 men; counts as FO and 81mm mortar, 12 FM (always rolls as normal until one man is left). Total: 50 models, equivalent to 9 Crossfire bases.